I was born and raised on a homestead near Anchorage, Alaska. Moved to the Paxson area in 1970 and have been here since. Originally I was a full-time trapper here, now it is a sideline. I commercial fish in Bristol Bay and Prince William Sound. I am the president of the local Fish and Game advisory committee and a member of the Second Chance League of Fairbanks. The Second Chance League is an organization devoted to evaluating and training unwanted sled dogs from the Fairbanks Animal Shelter. My personal goal is to raise awareness, within the sport, of the ability of these cast-off dogs. 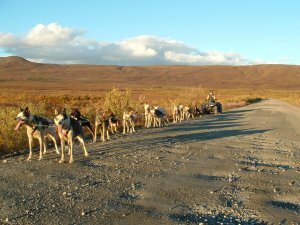 My primary interest is in long-distance mushing events, but I have participated in sprint and stage races, and continue to do so. My first dogs were used for trapline transportation in the early 1980s. 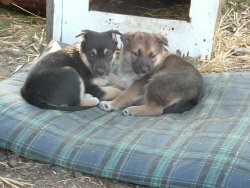 My first experience was with a 3-dog team made up of a German Shepard, a Black and Tan Hound and a mixed breed sled dog. I spent an hour and a half going 3 miles; later that spring I took this team on a 150 mile trip up a friends trapline. Sled dogs have been an ongoing learning experience for me; rarely a day goes by without discovering something new. I believe that we must constantly be experimenting with new training techniques in an attempt to do the very best we can with our animals. In the past I have kept about 20 dogs; including pups and retirees. This season, Zoya DeNure and I have combined our Kennels, added about 20 rescue/shelter dogs for a total of about 50. 8 chains; 3 qt. stainless bowls, unattached. 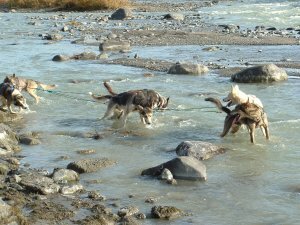 The ability of dogs to reach the other dogs around them to play and interact. The dogs mental heath is by far the most important thing here. A loose dog should never want to leave the confines of his kennel area, and rarely even leave the immediate circle of his surrounding dogs. Dry kibble in the summer; a good grade of 30/20. Soaked kibble during training, again good 30/20 with the addition of fish/fat/meat. 4 legs in working order. I believe that all dogs are trainable no matter their emotional state. We dont train individual dogs; we are training a dog team. No, all pups are trainable. I try not to make any pre-judgement of pups. All dogs are capable of making the team. I have had dogs for as long as 4 years before they were able to competitively race. All dogs are capable of racing competitively. To work together smoothly as a team. Normally I would choose the type of race that I personally enjoy, this season my race choices hinge on visibility for our Shelter team. Patience and the ability to recognize team strength or weakness. 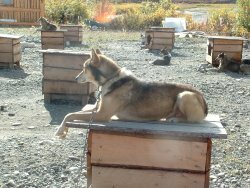 I would like to have the sled dog community be more aware of the dogs that are being culled or passed around, and to take more training time with the dogs they have. Dont be in a hurry, approach this sport with an open mind.